Back Row: Muriel Jolly, Nelly Jolly, Nora Jolly, Elsie Jolly, Mur and Win (Muriel & Winifred Wait friends of the family who came to play Tennis) Elizabeth English, Mrs Jolly from the Rectory Farm. 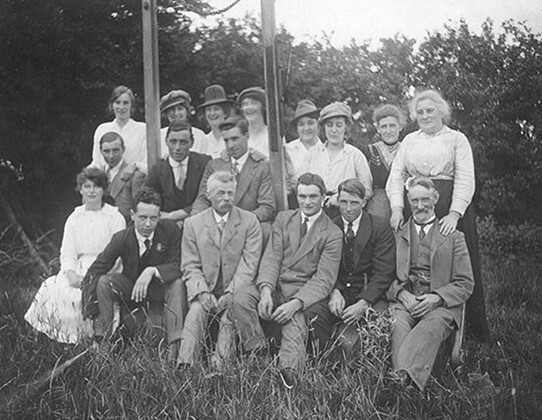 Middle Row: Mac Jolly, Fred Cottis (husband of Nelly Jolly), John Jolly. Front Row: Bell Peck, John Frederick Peck, Charles Peck, Rowlie Jolly, Pickle, Mr Jolly. Pickle may have been Malcolm (Pickles) Barton. 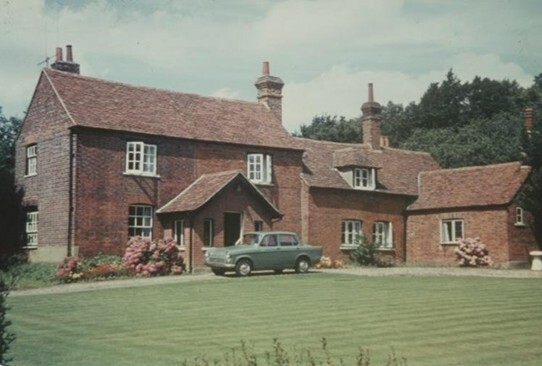 He lived at Lambourne Mead, Canewdon. Apparently at some stage Gusted Hall was gutted to its original state and that the National Trust were involved. House. C17 (1600‘s or 17th century) or earlier origin with C19 (19th Century; 1800‘s) extension to left and C18/C19 kitchen (C18 1700‘s or 18th Century) forward right. Timber framed, red brick faced, red brick extensions to left and right. Red plain tiled roofs. 4 chimney stacks, left, off centre right and rear of original range, to gable apex of C18/C19 kitchen range. 2 storey left range, one storey and attics with hipped dormer to main range, single storey right kitchen range. 2:2:1 window range of C19 2 or 3 light casements with transoms, segmental arches. Gabled porch to left range. Chamfered bridging joists to left range. Flat section ceiling joists to original range, wall studs visible in stair cupboard. Large chimney stack now with () C20 fireplace. 2 C19 cast iron fireplaces in bedrooms. Several original vertically boarded doors. Side purlin ridge board roof to C18/C19 kitchen range. Philip Morant says of Grested or Gristel Hall that Roger Darcie d. 1508 held the Manor of Gusted Hall of the Earl of Ormonde of Rochford Hall and it was held by William Harrys 1556. Philip Benton the Rochford Historian writes that it took its name from Peter Grestede 1338. P. Morant History of Essex 1763-8. P. Benton A History of Rochford Hundred 1873. Article Sylvia Manley Essex countryside July 1972. There is an article elsewhere on the site by Andrew Kyd who lived at the Hall for many years. Here is a link. This page was added by Peter Cottis on 06/10/2018.